The 41st Porsche Tennis Grand Prix has also enticed the world’s crème de la crème to Stuttgart. Five of the current Top 10 have already entered the long-running tournament in the Porsche Arena from 21 to 29 April. They include both the number one, Simona Halep (Romania), and the number 2, Garbine Muguruza (Spain). Simona Halep enjoyed the best season of her career in 2017 when she won the Porsche Race to Singapore, the official qualification for the WTA Finals, as well as the tournament in Madrid. She was also the runner-up at the French Open in Paris. Garbine Muguruza claimed her second Grand Slam title after the 2016 French Open by winning Wimbledon. Other Top 10 players set to play in the Porsche Arena in 2018 are Karolina Pliskova (Czech Republic/number 4), French Open winner Jelena Ostapenko (Latvia/7) and Caroline Garcia (France/8). They will be joined by another Grand Slam winner, namely the US Open champion Sloane Stephens (USA). Tennis fans can also look forward to superstar Maria Sharapova, who won the Porsche Tennis Grand Prix three times in succession between 2012 and 2014 and who was the subject of worldwide interest when returning to competitive tennis at the anniversary tournament in 2017. Angelique Kerber, the Stuttgart winner in 2015 and 2016, will also definitely be in the line-up. A repeat of the sensational 2017 Stuttgart final is also possible: Frenchwoman Kristina Mladenovic, the present world No. 11, has already signed up for the event. After a long injury break, last year’s winner Laura Siegemund is confident of returning to full fitness and being able to appear in front of her home crowd. 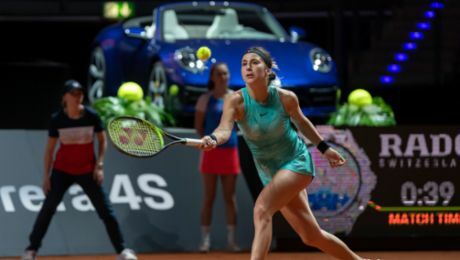 The 42nd edition of the long-standing tournament in the Porsche Arena in Stuttgart at a glance. As a part of the PTGP supporting programme, Elina Svitolina was given a truly special driving lesson.